They tried. I know they tried. 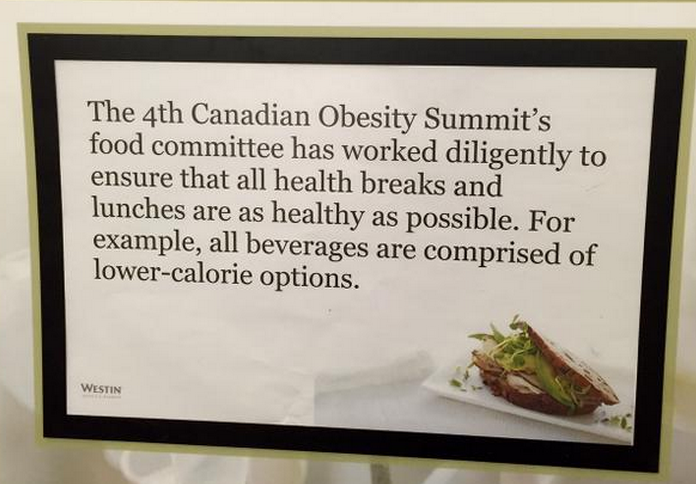 I know they tried because our office's RD Rob Lazzinnaro was on the food committee for the recent Canadian Obesity Network's (CON) Summit. 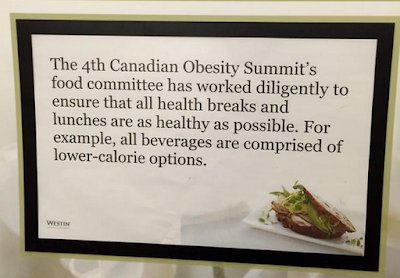 Not only did the food committee work with the hotel to ensure the mains were healthful, they also had some simple instructions. No liquid calories, and no junk food. Well, on the first day right next to the sign from CON about eliminating liquid calories was a bowl of cinnamon churros. Juice, and not just juice but ridiculously leanwashed sugar bombs by Odwalla were present at most workshops. And along with lunch on at least one of the days came a bag of Doritos. Having helped to organize a conference myself a few years ago, we experienced the same phenomenon. We had very explicit instructions around soft drinks and juice, and yet, despite those explicit instructions, in 2 of the 3 venues for our travelling road show, out the soft drinks and juice came. A few weeks later and Rob was now battling the provision of muffins at a public health event meant to promote healthful eating for kids. The muffins suddenly appeared on the already agreed upon menu when a food service provider offered to provide them free of charge. For most intents and purposes commercial muffins are more fairly describable as cupcakes, and certainly their provision at this even would continue to perpetuate the notion that somehow cupcakes without icing are healthful choices. What was striking wasn't simply that one of the health professionals organizing the event gave the muffins an "ok", but that when Rob brought up his concerns, he was faced with indifference from his colleague. Society's normal is junk food. It's the default. It's a tide. It's difficult to stop the tide. But we'll keep trying.